Once when I was asked why I am not a painter, I answered, "Because I don't know how to paint. I know how to sew." But I remain fascinated by hard-edge colorist painting and non-objective abstract art. Which is to say I love color, line and shape—they need not represent anything! Abstract paintings and sculptures capture my attention and move me emotionally. My intent as an artist is to create exquisite quilts that will somehow move the viewer. After over 32 years in Alaska, my husband and I sold our bookstore and moved to Fidalgo Island in late 2016, to become full-time artists and writers. Julie received the Alaska's Emerging Artist award in 2015, and her work has been shown in galleries, museums, and juried art shows in Alaska and the Lower 48 states. 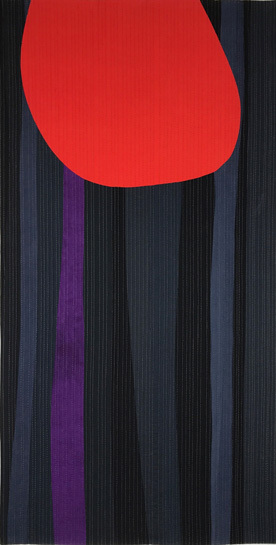 One of her quilts is currently travelling the USA as part of the highly regarded Circular Abstractions exhibition.